Grand Central Life & Style, 9781455528639, 384pp. Many chefs keep notebooks in their kitchens, filled with recipe ideas, new ways to use an ingredient, and records of what did or did not work. But how often do ordinary food lovers get to peek inside? 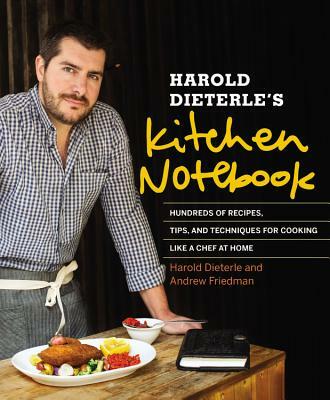 Now Harold Dieterle-- chef-owner of New York City's popular restaurants Perilla, Kin Shop, and The Marrow, and Season 1 champion of the hit TV show Top Chef-- pulls back the curtain to give every home cooks a look inside his kitchen. Incorporating his eclectic mix of New American, Italian, Thai, and German influences, this cookbook offers restaurant-caliber dishes that can be easily prepared at home. While each dish comprises several elements, one standout ingredient or component will be identified in each (starred here) and accompanied by Harold's notebook entry sharing why that ingredient is so special and offering a number of additional ways to use it. Dishes include: Fresh Ricotta Cheese* with Acorn Squash Tempura, Truffle Honey, and Toasted Bread; Wild Chive* Tagliatelli with Shrimp, Cuttlefish, Shallots, and Sea Urchin Sauce; Roasted Whole Chicken with Spaetzle*, Chestnuts, and Persimmons; Grilled Venison Sirloin with Potato-Leek Gratin, Swiss Chard, and Huckleberry* Sauce; Warm Flourless Chocolate and Peanut Butter Soufflé Cake with Coffee Crème Anglaise*; and many more! Harold Dieterle lives in New York, NY. Andrew Friedman lives in Brooklyn, NY.